Lee Sung-Jae and Sul Kyung-Ku in Public Enemy. The Skinny: A dirty cop suspects that a respectable businessman may be responsible for a series of brutal murders in Public Enemy, the award-winning 2002 box office sensation. Thanks to strong performances from Sul Kyung-Ku and Lee Sung-Jae, this darkly comic cat-and-mouse thriller is one film worth checking out. Sometimes, bastards are just fun to watch. Such is the case with Detective Kang Chul-Joong, the rough-around-the-edges anti-hero of Public Enemy, a gritty, bloody cop movie that earned both critical praise and box office success upon its release in 2002. Prone to taking bribes and beating out confessions, Detective Kang is clearly not your average hero. With internal affairs breathing down his neck and his career in jeopardy, Kang seems utterly lost - that is, until a chance encounter with a brutal serial killer reawakens something inside of him, spurring him to take action and bring the murderer to justice. But the biggest challenge facing Detective Kang is the identity of the serial killer. He knows who it is; he just can't prove it. First of all, Kang doesn't have any physical evidence. Secondly, his reputation as a cop is at an all-time low. And perhaps worst of all, the murderer is actually a respected member of society: Chul Gyu-Hwan (Lee Sung-Jae), a charming businessman who is not only a wonderful family man, but is so wealthy that he would have no motive to kill anyone. Or so it seems. That perception is far from the reality, as Chul will do just about anything to insure his success or avenge his wounded pride, even if it means murdering his own parents! What follows is a dangerous game of cat-and-mouse in which the fallen lawman does everything in his power to bring the remorseless killer to justice. But does Kang have what it takes to get the job done? Public Enemy does a fine job in building a sense of anticipation for the face-to-face confrontation between these two characters. The film begins by introducing them separately, following each one's story so the audience can see their individual situations, their problems, and their motives. Once these separate tracks have been laid in the first quarter of the film, the two characters finally cross paths, intensifying the narrative's momentum exponentially. While I'm still not sure of the legal ramifications of the final showdown, it nevertheless makes for cathartic, if brutal entertainment. In Public Enemy, there is no black-and-white depiction of good guys and bad guys; almost everyone is painted in shades of gray. While Detective Kang represents the side of "good," he has enough character flaws to show that he is far from the conventional hero. In his role as the hard-bitten detective, Sul Kyung-Ku is electric onscreen. You never know what his character is going to do, and that unpredictability makes him a joy to watch. 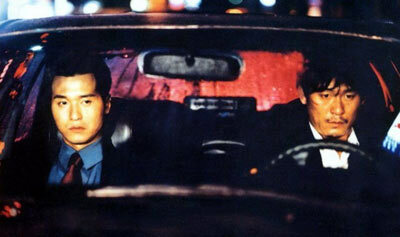 While Kang is still pig-headed and somewhat simpleminded throughout the film, his good qualities slowly emerge to contradict the corrupt figure he's become. Even when he's violating police procedure, there is a kind of integrity in his actions. While Kang does not seem to perceive it on a conscious level, this case is his one last shot at redemption, but as the film wears on, the audience grows unsure of whether he'll live to see it. As the second lead, Lee Sung-Jae portrays a believable sociopath, a man who wears a smile to mask his true evil. Lee believably portrays the two personalities, showing Chul as a man able to operate in the world as a seemingly loving husband, good son, and all-around nice guy. But when someone offends his delicate sensibilities, homicide is Chul's natural response. Lee makes this transformation believable, and convincingly portrays a character who is intelligent and immensely proficient at what he does, making him an excellent foil to Detective Kang, who is his polar opposite in appearance and demeanor. In between all the murder and mayhem, there's a nice bit of comic relief spread throughout Public Enemy. Kang Shil-In does a fine job as Detective Kang's superior, whose character serves as both stoic mentor and comic straight man. The more overt humor comes in the form of supporting actors Lee Moon-Sik, Yoo Hae-Jin, and Sung Ji-Roo, all playing assorted lowlifes who appear at different times to lighten the mood, yet still within the framework of advancing the story. This mix of light and dark may seem contradictory or even off-putting, but somehow director Kang Woo-Suk makes it work.